When you walk into my newly renovated laundry room (oh, how I LOVE laundry day now!) you'll see this trio of jars high on a shelf. 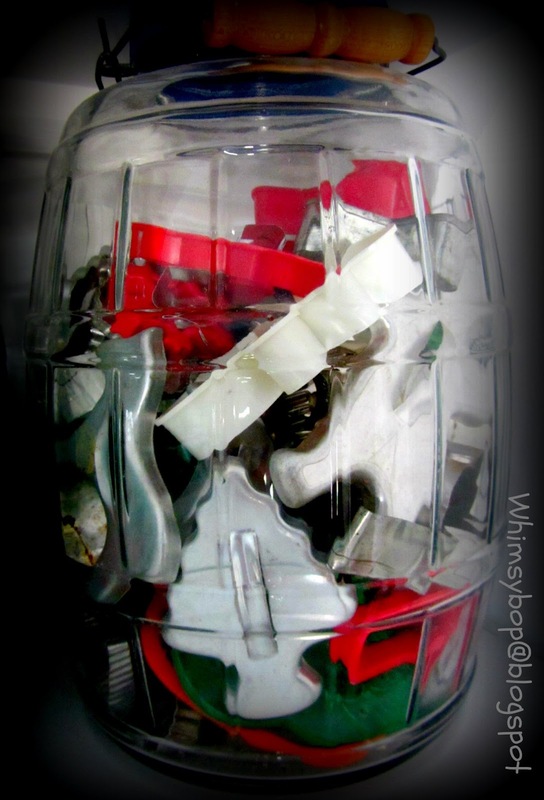 The first jar holds my collection of plastic advertisement icons from my childhood: The Stay Puft Marshmallow man, Snap, Crackle & Pop, The Pillsbury Dough boy and his Mrs., Sprout (I think he's related to the Jolly Green Giant) , Mr. Peanut, and Bob of Bob's Big boy restaurant. Next on the shelf is my ever-growing collection of kitchy gadgets. I have lots more hiding in picnic baskets, but I had to stick these in a jar since they're just too cute and too colorful to keep them hidden. Last on this shelf is my jar full of cookie cutters. It's a mixture of new and vintage cookie cutters I love to use when I get in a baking mood. 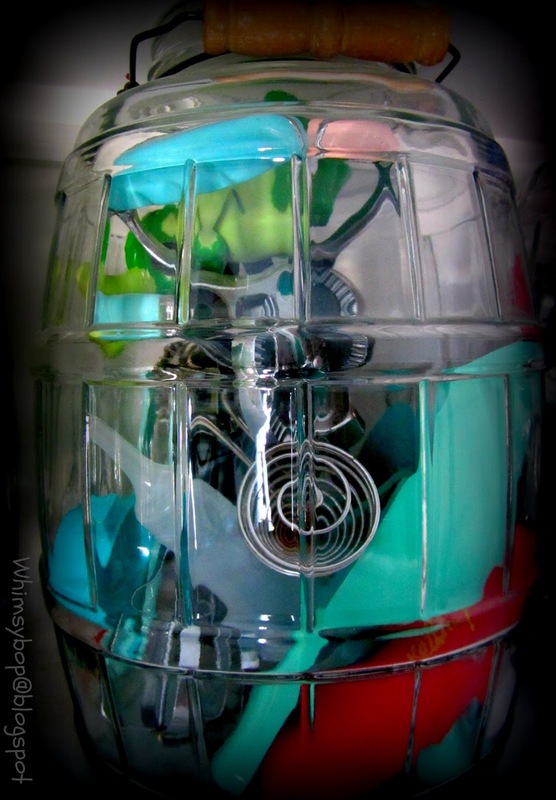 I like keeping them in a jar because not only do I love seeing all the various shapes, but I don't have to wash them each time I use them because I know they're kept nice and clean even on a dusty shelf. I've been collecting McDonald's Happy Meal toys since my kids were wee little. Every summer we'd spend a few weeks visiting my folks in South Carolina and every Wednesday morning we'd hit the Pickens' flea market, (leaving the house before sunrise). My kids were always on the hunt for toys and would stop at EVERY vendor's space and go through boxes and boxes in search of their favorite action figures, superheroes and cartoon character toys, usually paying a dime or quarter for each one. Of course I couldn't just stand there and watch - like any good Mom I had to get on my knees and dig with them. 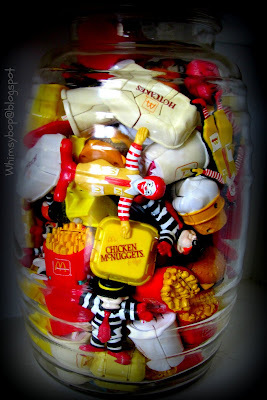 Soon I began to take notice of the Happy Meal toys resembling my favorite McDonald's menu items and started my own pile on the ground - and a collection was born! I've slowed down buying them, primarily because my kids don't dig as much as they used to and the prices aren't cheap anymore either - but if I find one for a quarter or a dime, it's coming home with Mama! I've saved this jar for last because it's the grandfather of them all; it's my oldest and largest one and measures seventeen inches high! I bought it about twenty years ago at an antique shop in California and it has ALWAYS been my Pez jar (even before the kids came along). 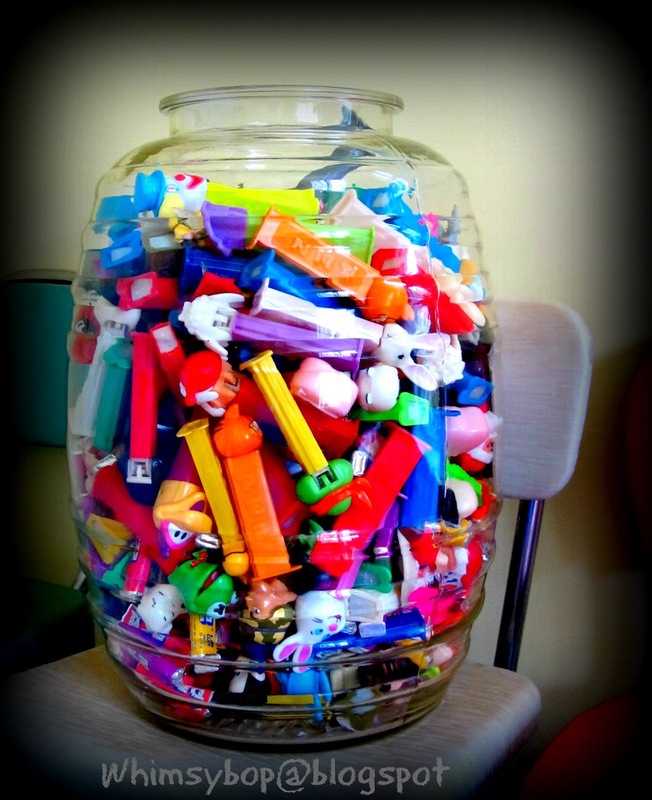 Once the kids joined our family the jar started filling up pretty fast - mostly because of a tradition we started which made the 1st day of each month our official family "Pez Day." On Pez Day the kids and I went out in search of a new Pez dispenser we did not yet own, which became quite a challenge after a few years. Pez Day eventually fizzled out after about 5 or 6 years; now our teenagers are happy to receive a new pez dispenser in their Christmas stocking and Easter basket. Needless to say, we now have more Pez in our house than any family (or small country) should be allowed to have. Most of our Pez dispensers are hidden away in an undisclosed part of our home because if they were all out in the open, we'd be known as the freakish Pez hoarding family (and we wouldn't want that). It is comforting to know, however, in the event of a food shortage or a zombie apocalypse, our family will most likely outlive the remaining human race because of the crazy amount of Pez candy that will most likely sustain us during such a crisis (if you can make it over to our house, I promise we'll share). Stay tuned for MORE Collections in a Jar - I know, the excitement is building! Love your huge jars! LOL about your PEZ collection! I think I'll use a color wash/rinse for my hair when daughter gets married next Sept. "SHE" said that would be nice! LOL!!! Love these very cool jars. Reminds me of the big jars raisins came in when I was just a little girl. I believe your jars are quite a bit bigger though. My friend & I would sit on her couch and eat raisins out of the jar together. Sometimes we'd both put our hands in & our hands would get stuck when we both pulled our hands out at the same time. It was so funny...to us anyway. Good times. Hey Mocha Momma - I LOVE your trip down memory lane, thanks for taking us along :) It's so cute that you still remember those vivid details - I guess you REALLY loved eating those raisins!